The task train. Add tasks to encourage children to accomplish new responsibilities. (Open the task train) Print, laminate and cut out the task train. Hang it at children's eye level near the area used for circle time. Here are a few suggestions which will help you distribute tasks. Place all pictograms representing tasks on the floor face down, have children pick a pictogram or ask children which tasks they would like to be responsible for. You may also want to place pictograms face down on the floor, pick one at a time, and ask children to raise their hands if they are interested in being responsible for it. If you wish, play musical ball. The child who has the ball when the music stops, chooses his task. Have the group sit down. Begin the game by saying, "I'm going on a trip by..." (ex. : airplane). The game continues with a child saying, "I'm going on a trip by airplane and by train." Each child adds another means of transportation. Place chairs in a row one behind the other. Children board the bus and take turns being the bus driver. You may add accessories such as backpacks, lunch boxes, etc. Repeat having children pretend they are in an airplane. Accessories can range from suitcases and hats, to Hawaiian necklaces, etc. For a boat, set a large blanket on the floor. Be sure to make it clear that the surrounding area is the water. Use a small spray bottle to spray children who touch the water (floor around the blanket). For a train, children hold on to each other's waists and walk around the daycare. You can add obstacles such as a cushion on the floor for them to avoid. They mustn't let go or the train will be derailed. Turn your corner into a construction site with various construction vehicles (tractor, crane, dump truck, etc.) If you feel up to it, why not fill a small pool with sand and let children play with the vehicles....the walls can be decorated with different pictures too! Light blue sheets of paper (for sky), brown and black paper (for ground), and dark blue paper (for water). Transform your role play area into an airplane, a train, a boat... follow your imagination! A few chairs paired with some decorations often do the trick. Children will have fun for hours! Add clothes (captain's uniform, pilot's uniform...) and discuss professions related to each means of transportation. You can use the word flashcards! Create a garage area! Work clothes, gloves, and a few tools will do just fine. If possible, add an old tire, children will love it! The pictures may be used as a memory game or to spark a conversation with the group. Use them to decorate the daycare or a thematic corner. 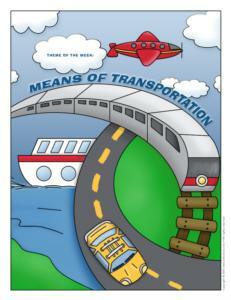 (Open picture game - transportation) Print, laminate, and store in a "Ziploc" bag or in your thematic bins. (Open transportation dominoes) Print, and glue onto cardboard. Laminate and cut out. This game is for 2 to 4 players. Each player picks five cards. Make a pile with the remaining cards on the table. Place one card to begin. The first player then attempts to match one of his cards to the initial card. If he has an identical card he places it side by side with the card already on the table. The second player does the same and so on. If a player cannot play one of his cards, he must pick an additional one from the pile. If this card cannot be played either, it is the next player's turn. The game ends as soon as one player has emptied his hands. Invent a story in which you are leaving on a very long trip with the group. Throughout your very long trip, you will use many means of transportation. Begin with a car to drive to the airport (children pretend to drive). Next, get on a plane (children pretend to board a plane), and so on until the end of the trip. You can then make the return trip by reversing the order of the means of transportation, a good memory exercise for children. Prepare green, yellow and red cards to represent street lights (or use crayons). Children walk around the daycare. Show the green card and say, "Green light." Children must walk faster without running. Show the yellow card and say, "Yellow light." Children must walk slowly as in a slow motion movie. Display the red card and say, "Red light." Children must stop and remain still. Alternate the different colors. On a large piece of white cardboard, trace lines representing a tic-tac-toe game. 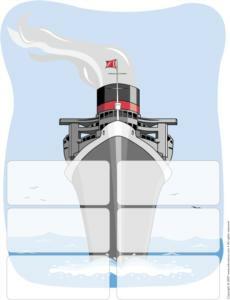 (Open pdf train/boat) Trains are the equivalent of "x's" and boats are the equivalent of "o's". Have one child use trains and another use boats. They take turns placing trains and boats on the game. The first player to place three identical means of transportation in a row or diagonally wins. Select a child to play the role of the policeman. You request his help to locate a lost child. Describe another child in the group (the one you are trying to locate). See if the child playing the role of the policeman can identify the correct child. Encourage children to move about the daycare as if they were airplanes to the sound of rhythmic music. Have them fly on their tiptoes then come back down on their heels. Start the engine and spin around twice. Stretch your arms out to the side. You need a red piece of construction paper and one green one. Write "Danger" on the red paper and "Safe" on the green paper. Have children cut out pictures in magazines, flyers, catalogues, etc. Glue pictures representing safe things on the green paper and dangerous things on the red paper. You will need four corners marked off with circles made with hoola hoops or cord. These four corners represent train stations. Children become passengers. The leader of the game is the train station master. When the signal is given, the train station master must say, "Passengers, change stations." Children run to another corner (train station). During the change, the train station master attempts to catch passengers (children). Each passenger the master catches becomes a train station master too. The game ends when all the passengers are caught. Standing, legs slightly apart, arms to the sides, the helicopter will slowly start. One arm draws a large lateral circle backwards. It then picks up speed slowly (without abrupt movements). After ten rotations, the other arm begins to turn backwards also. Repeat making forward circles, etc. Which means of transportation am I? Play transportation sounds for the children. Have them guess which means of transportation it is. You can provide pictures to ensure proper association. Cut a sandwich into four triangles. Cut an apple making 1cm slices. Place a quarter of a sandwich on top of each apple slice. Create a fireman's helmet by cutting out a large strand of red construction paper. Make a headband with it by stapling at the back. (Open craft - fireman helmet) Print. 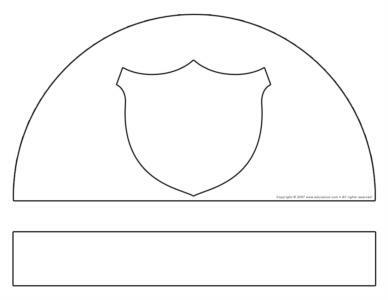 Children color and decorate the shield as they wish then cut it out and attach it to the strand of red paper. 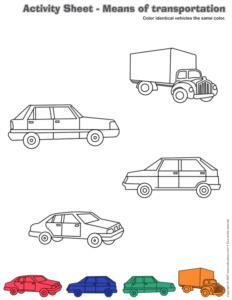 (Open coloring pages for theme - transportation) Print.